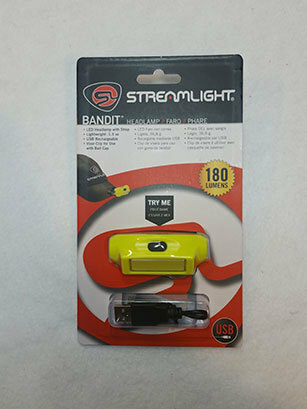 Lightweight and low profile best describes the Bandit Headlamp by Streamlight. This great general purpose headlamp provides a nice low-profile design allowing it to be taken anywhere. This USB rechargeable lamp produces 180 lumens on high and stays lit for every second of the 2 hours advertised. At night, the 180 lumens is more than sufficient lighting to see the trail. The lamp allows for different brightness settings with a low level of 35 lumens and a third emergency flash setting utilizing all 180 lumens. I find this setting great for runners or anyone wanting to be clearly visible while working on a roadway. The casing is made of impact-resistant polycarbonate, the same material your eye glasses and toothbrushes are made from. The lamp is IPX4 weather resistant, meaning splashes of water from any direction will not penetrate the casing. A visor clip for attaching the headlamp onto your cap is included, along with a short USB cable for charging and an elastic headband. Overall, I have used the headlamp for a variety of different activities and have found that the 180 lumens are sufficient for most work. 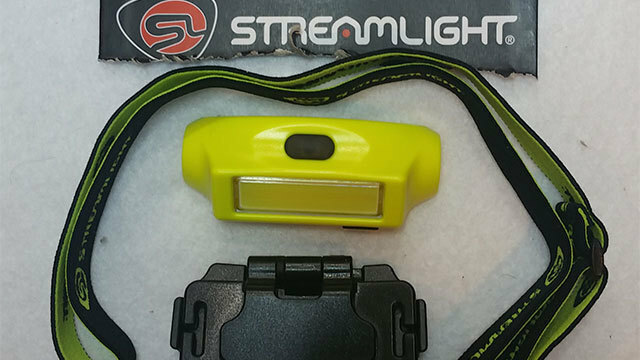 Streamlight offers the headlamp in two different colors, yellow or black. This headlamp weighs just under 37 grams or 1.3 ounces. I really enjoy the minimal design of this headlamp and hope that the Bandit features a green lens for hunters in the future. For more information, please visit Streamlight.com.